How do I use the Stacked Area Chart widget? Visually analyze your data by showing the distribution of different categories over time. The Stacked Area Chart shows the contribution of different categories to an actual total over time. It’s great for conducting part-to-whole analysis. 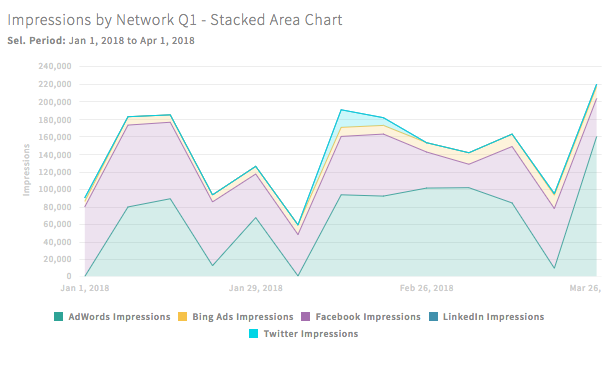 For example, use it to see which networks contribute the most to the overall number of impressions. The 100% Stacked Area Chart shows the change in the distribution of categories as parts of a whole over time, where actual total doesn’t matter (like showing a pie chart over time). It’s great for seeing how different entities contribute percentage-wise to an overall metric. 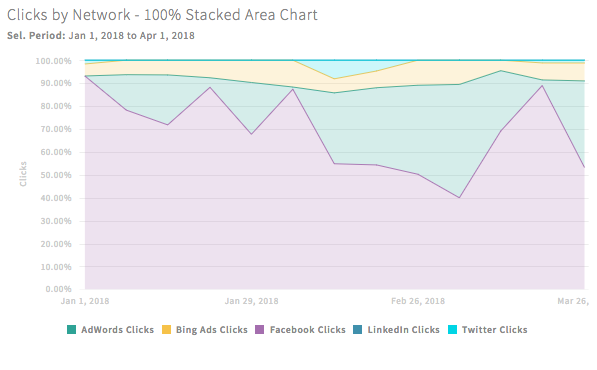 For example, use it to see which network contributes the highest percentage of clicks over Q1. 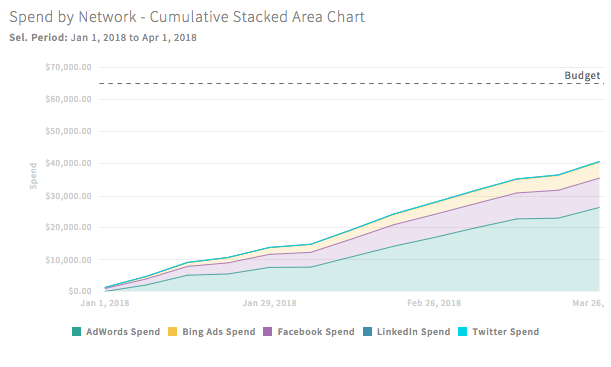 The Cumulative Stacked Area Chart shows the contribution of different categories to a cumulative total over time (like showing a stacked progress widget over time). It’s great for seeing how different entities contribute to progress towards a goal. For example, use it to show progress of spend towards a specific budget. Step 8: Add filters and/or goals lines as necessary. Have questions about the Area Chart widget? Feel free to reach out to us at support@adstage.io.